Hope you're all having a wonderful Tuesday. :-) I finally got caught up with all of you last night so this morning I was able to get up and finish this little sweetie for this week's challenge at There She Goes. I'm not playing of course, just giving you some inspiration if you'd like to play along. The challenge theme is to make a card or project using something sweet: candy, cookies, ice cream…CAKE!! As a special treat, for our birthday celebration, the random winner of this challenge will receive a $15GC as a prize!! To be eligible for the giveaway,create a card or project using this week’s challenge(something sweet) and then come back to the TSG Blog to add your name and a link to your project in the InLinkz that is located at the bottom of this challenge post. This challenge is open until the winner has been announced on the following Monday (September 17th). The winner will get a $15 gift certificate to use in the TSG Web store! By participating in this challenge,you may also find yourself in the Trendsetting Spotlight that shines on the TSG Blog every Thursday. We will be on the lookout to find challenge cards that stand out and show Trendsetting qualities. TSG stamps are not required to participate in the challenges but are appreciated You do not need to have a blog to be able to participate in the TSG Challenges!You can simply add the URL link from your project after it has been uploaded to your online craft gallery. If you upload your card to an online craft gallery, please use the keyword TSG172 so we can check out your beautiful work! Stamp: There She Goes Clear Stamps "Make A Wish"
gorgeous card - love the icing effect! makes it look scrummy! Gorgeous card Tracy and love your candle!! Wow, love the cupcake! The details are amazing! Wow Tracy! I've been away for a few days and look at all your postings....you have been busy. I love this one..... cupcakes are adorable. I'll go and leave a short comment on each one now. This cupcake looks scruptous! Love the way you scored the paper and did the yummy frosting! Super adorable, Tracy! Gosh, that cupcake looks good enough to eat! And your homemade candle is absolutely perfect! Your card is really stunning! That cake looks yummy Tracy. I love the way you have added so much dimension to it and the colours are gorgeous. So, so fabulous! I love the "sprinkles"and the "candle" Beautiful work! This is one yummy looking cupcake Tracy & I absolutely LOVE your candle!! I'm glad you decided to add it...so cute! The little details in your cards are always amazing! This cake looks really yummy, Tracy! Love the sprinkles on the icing and how you've created that vellum bottom thingy and the rolled paper candle. Stunning!!! ahem, may I point out a challenge going on at CCCB? Love the design, very cute. OMGosh, that cupcake looks SO real and SO yummy! Gorgeous, Tracy! Wonderful little image, and all of the extra details you've put into it are wonderful. Really makes me want to reach in and have a bite! Thank you for entering this week's challenge at Card Crafter's Circle. We hope to see you again. Such a cute card. 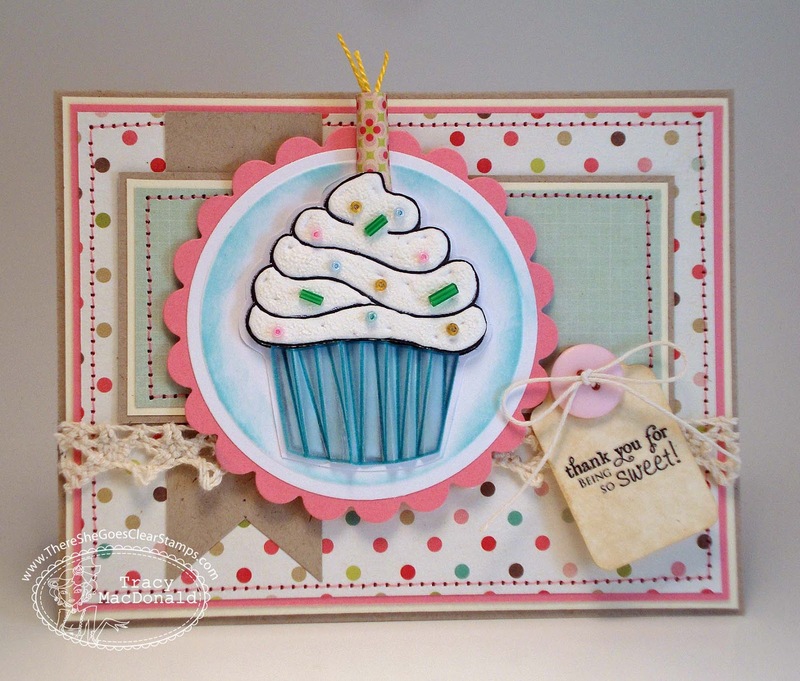 I love the fun polka dot paper in the background to sweet..
Yummy card, Tracy! Love the icing and candle. Beautiful card. So precious design. I have worked for the Plastic card printing and designing company and this card inspire me so much. I appreciate this. Could you be any cooler? A rolled candle with a flame flicker too? It's little things like that that you take the time to add that really make ALL the difference! Completely scrumptious and calorie FREE!! My entries are: #23, #109, and #213. Wow Tracy this is such a cute card! It's actually making my mouth water lol! Super adorable card, love all the 3D dimension; scrumptious cupcake! Congrats on your win at Sweet Sunday Sketch Challenge! All pictures on this blog are intended for personal craft use and inspiration. I don't mind sharing my ideas but please refrain from copying my photos and projects for any profit, contests, or publication. 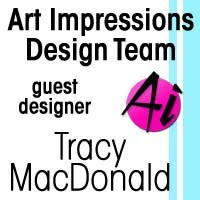 All content of this blog is copyright © I Wanna Build a Memory and Tracy MacDonald 2010-2018. In the spirit of full disclosure I previously or currently work as a freelance designer for the following companies and am compensated with free product from them. My opinions of these products are my own.